Recently my friend William Drinkwater let me in on a little secret – Blue Apron! Blue Apron is a company that makes me say “now why didn’t I think of that.” They send you 3 meals at a time, with all the ingredients pre-measured. That means I don’t have to decide what I’m going to cook, don’t have to search for a recipe, and don’t have to go to the grocery store. Genius! 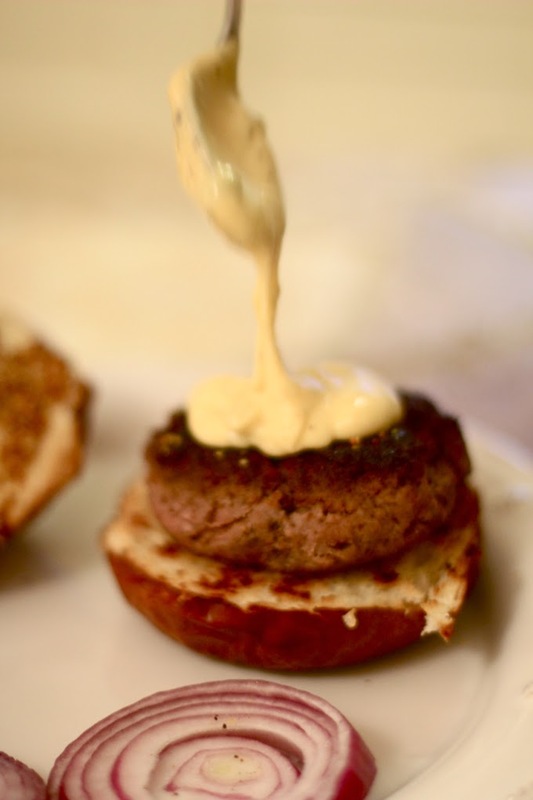 These were the Short Rib Burgers on Pretzel Buns (YUM) that we made this week. 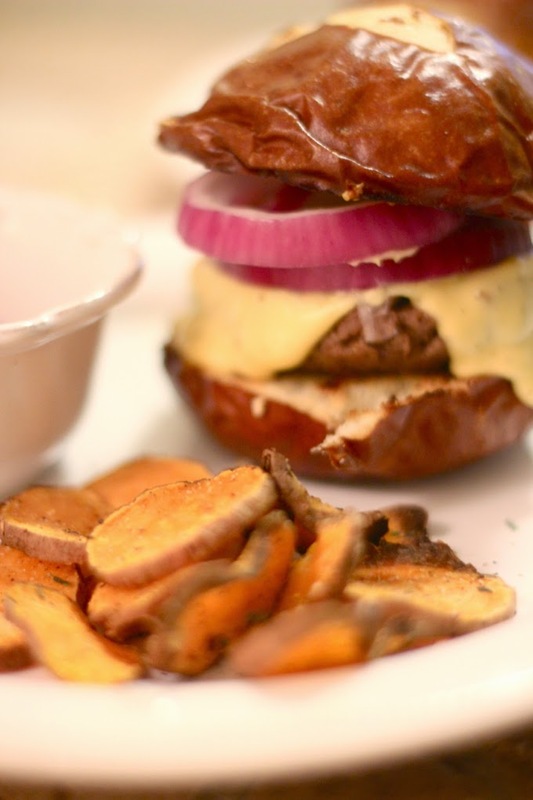 I always feel productive and chef-like after making Blue Apron and loved this sophisticated take on the simple buger and fries! Preheat the oven to 425 degrees F. Wash and dry the fresh produce. Grate the cheddar cheese. Slice the burger buns in half lengthwise. Pick the thyme leaves off the stems; discard the stems and roughly chop the leaves. Peel and slice the red onion into rings. Roughly chop the hops flowers. 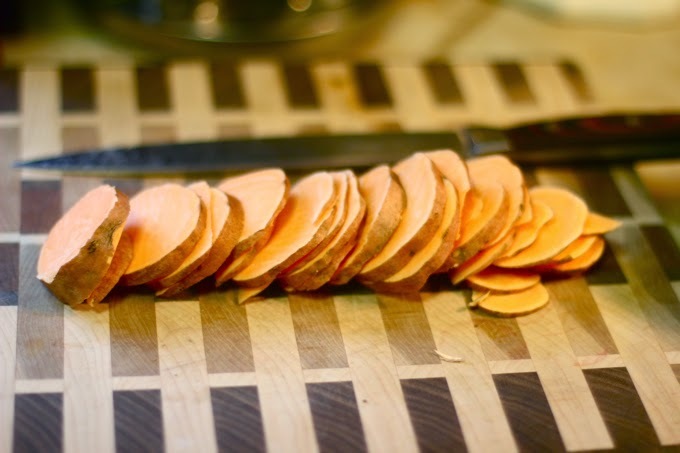 Thinly slice the sweet potato in to 1/8-inch thick rounds. 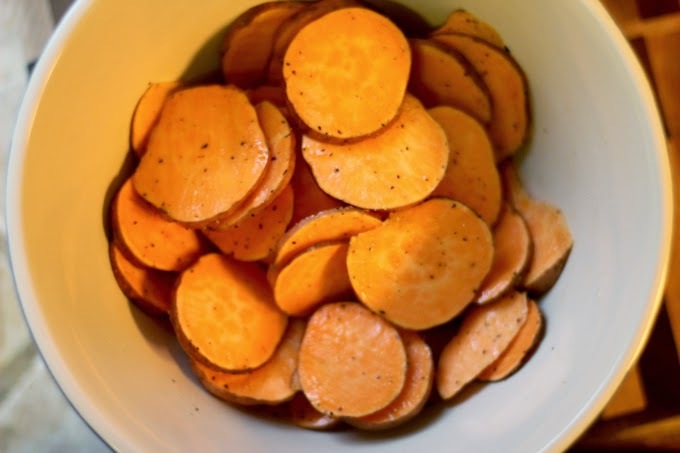 In a large bowl, season the sweet potato rounds with salt and pepper, and toss with enough olive oil to thoroughly coat. Arrange in a single layer on a sheet pan and bake 28 to 30 minutes or until browned, flipping the rounds halfway through. Remove from oven and sprinkle with the thyme. While the potatoes roast, in a large bowl, combine the ground short rib and breadcrumbs. 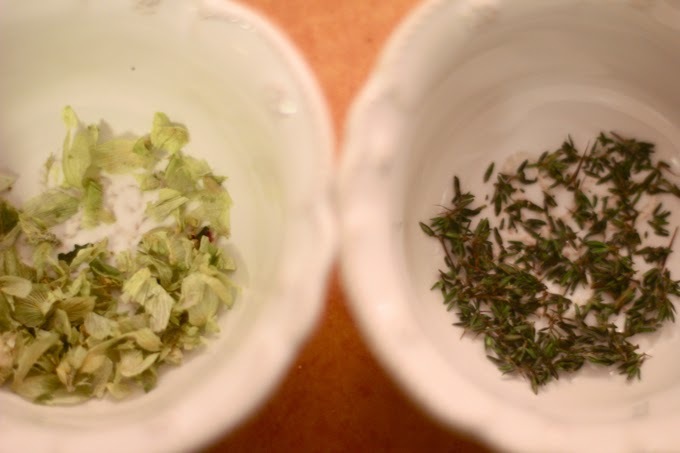 Season with salt and pepper and mix to thoroughly combine. Divide the mixture in half and form into two equal patties. Set aside. In a small pot, completely melt the butter on medium. Add the flour and cook, whisking constantly, 1 to 2 minutes, or until golden. Slowly whisk in the milk (use only half the carton). Bring the mixture to a simmer and cook, stirring frequently, 1 to 2 minutes or until thickened; season with salt and pepper. 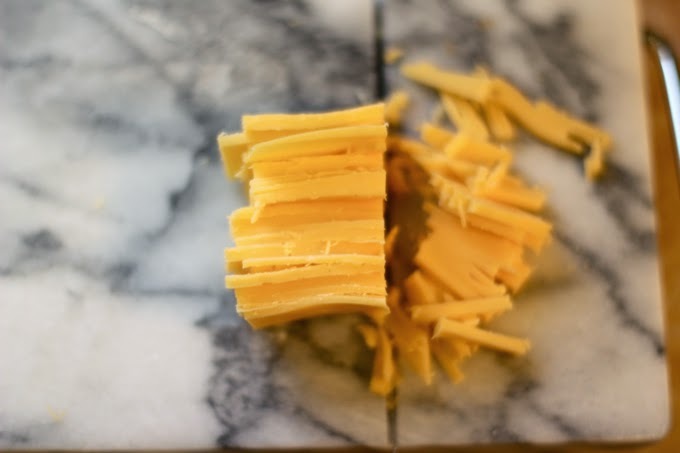 Reduce the heat to low, slowly add the grated cheddar cheese and cook, whisking constantly 30 seconds to 1 minute, or until no lumps remain and the sauce is smooth. Remove from heat and stir in the chopped hops flowers. Season to taste with salt and pepper. Set aside in a warm place. Heat a large pan (nonstick, if you have one) on medium until hot. Add the burger patties and cook 4 to 6 minutes per side for medium, or until they reach your desired degree of doneness. (You can check the doneness by cutting a small slit in 1 of the burgers.) 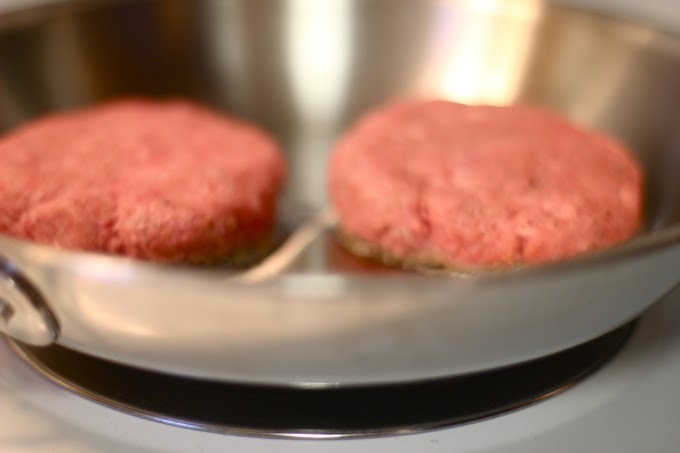 Transfer the burgers to a plate, leaving any drippings in the pan, and let rest for at least 5 minutes. In the same pan, heat the reserved beef drippings on medium-high until hot. 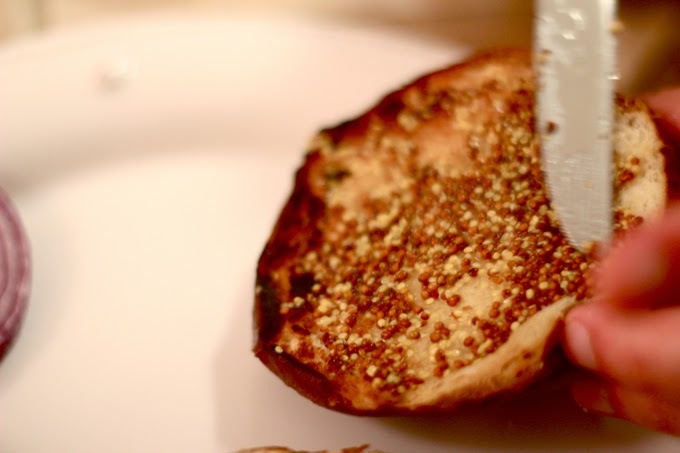 Place the pretzel buns, cut side down, into the pan and toast 2 to 3 minutes, or until slightly browned and warmed. 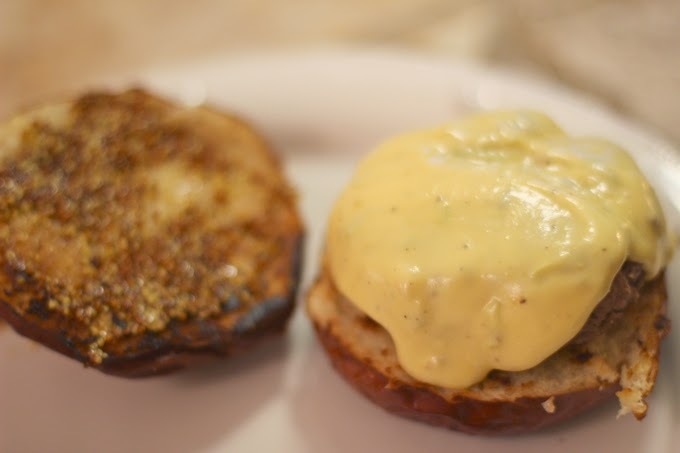 Spread half of the mustard onto the bottom of each bun. 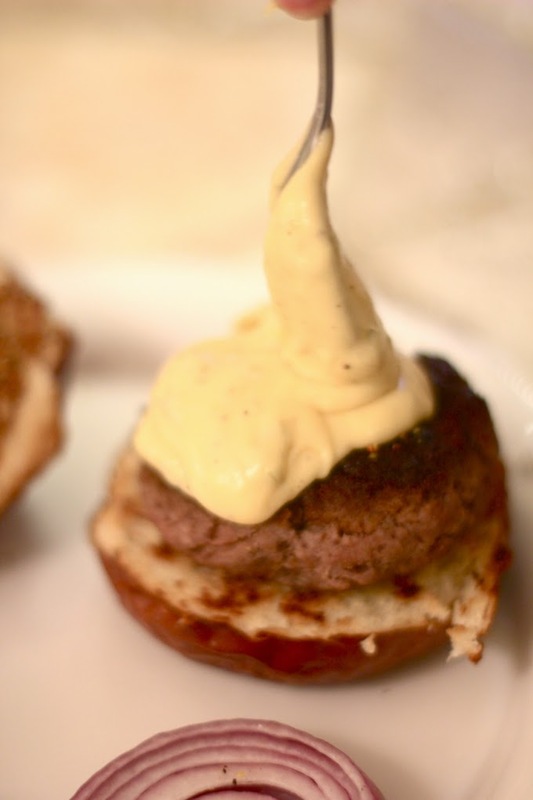 Lay a cooked burger on top of each bottom and ladle half of the cheese sauce onto each patty. 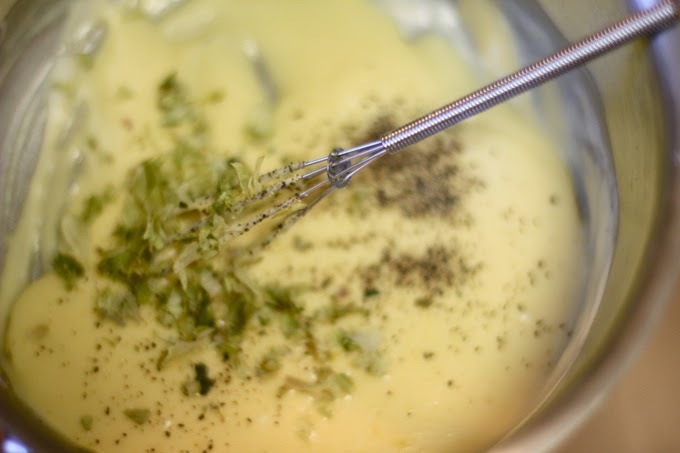 (If necessary, reheat the cheese sauce with a little more milk on low.) 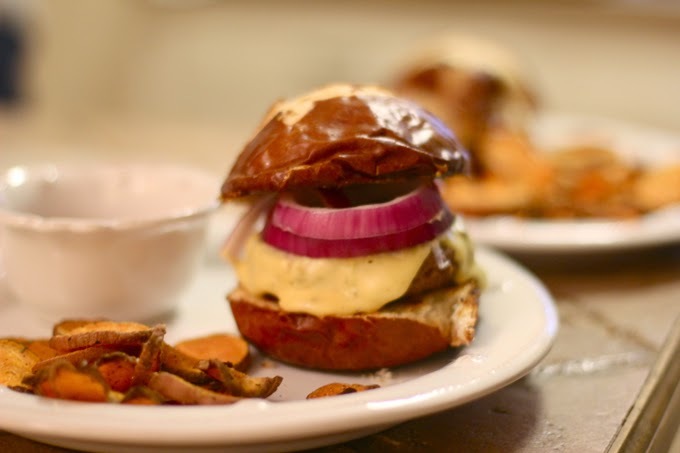 Top with as much red onion as you’d like (you may have extra onion) and the top of the bun. 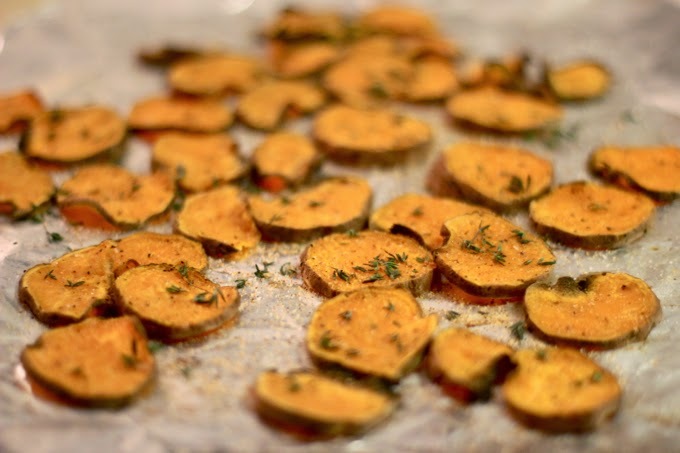 Serve with the sweet potato rounds on the side. ENJOY!